University of Delhi (DU) has extended the admission widow for the 1st phase vacant seats by one more day from erstwhile two days- July 28 and 29, 2016. According to DU officials, the admission for vacant seats in different colleges for the undergraduate programmes based on July 27th first merit list will continue till July 30, 2016, 12 noon along with the online payment of fees extended till 6:00 pm of the same day. Dr. J.M. Khurana, Dean of Student’s Welfare (DSW) told Careers360 that the admission window has been extended due to delay in the first merit list for UG admissions by a number of colleges. “It has come to our knowledge that some colleges could not announce the merit list in time for the admissions to be completed on 29th July, 2016. Therefore, it has been decided that admissions which was scheduled for 28/29th July, 2016 will be continued till 30th July, 2016 up to 12.00 noon. The time for payment of online fee has also been extended up to 6.00 p.m. on the same day,” said Prof. Khurana. He also said that there is no change in the admission process for evening colleges. “There is no change in admission schedule for the evening colleges. However, the subsequent schedule for undergraduate admissions remains unchanged,” he added, further. Earlier, the admission window for the first phase was scheduled to end by July 29, 2016 (3:00 pm), however, has now been extended till July 30, 2016. 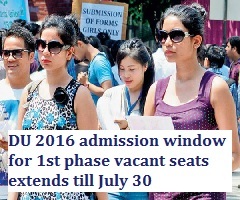 Moreover, the second merit list for DU 2016 admission for vacant seats will be out by July 30, 2016. Check here for DU 2016 Important Dates. Delhi University offers admissions to over 54,000 undergraduate seats for admission to various courses in as many as 77 colleges of the varsity. Currently, the admission process is on for vacant seats in different colleges through online UG admission portal.